Women and men have different needs and interests including in terms of WASH services, and both have a right to be heard especially in terms of decision-making. However, this was not the case for the women of one community in Layyah district in Pakistan’s Punjab Province. In this village – one of 164 covered under the DFAT funded ‘Scaling up PATS in Punjab’ project - inequality had long been reinforced within the community. “We had needs but the men would not pay heed to it when it comes to water and sanitation issues; our voice was not often heard and our issues always remained invisible to them,” shared Neelam Bibi [i], one of the most respected women in the community. This exclusion of women’s voices was reflected in the all-male membership of the initial Village Organisation (VO) established to support implementation of the project by Plan International Pakistan’s partner the Housing Urban Development and Public Health Engineering Department (HUD & PHED). Subsequently, and as a result of project efforts, the level of understanding in the community of the importance of also engaging women for making key decisions was increased. As a result, to ensure that the voices of the village’s women were heard and their needs addressed within the project, HUD & PHED supported the formation of a second, women-only, Village Organisation (VO) with Neelam Bini as the unanimously elected Chairperson. This VO acts in tandem with a men-only VO and has enabled the women to be part of making decisions that matter for them. The first thing the women’s VO decided to do was to reinforce the project’s earlier health and hygiene messages for the village’s women and girls. “Women needed to be reminded about the importance of health and hygiene. It is very important they do not deviate from this practice to their old ways so our ODF status can be maintained,” Neelam shared. Within three months of its formation the women’s VO conducted three health and hygiene sessions to ensure continued good WASH practices. Next on the agenda was litter-free village streets, which along with an ODF environment is a core component of the national Pakistan Approach to Total Sanitation. When Neelam Bibi calls for support, everyone listens. She, along with other VO members, called upon the women of the village to take ownership of the area of the street in front of their houses, and clean it. “The women’s ownership for environmental hygiene was astonishing. The streets were cleaner than ever,” said Neelam. 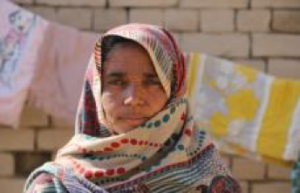 Through the Scaling Up PATS project Plan International Pakistan has support the development of a new confidence and sense of self-worth amongst the women of the village. The project has also provided an opportunity for women to have a voice in discussions and a chance to take ownership – and to take action – in relation to issues of importance for them. This has helped to bring a desired change in their life along with improving their sanitation and hygiene practices. “We are thankful to Plan International Pakistan for giving us a voice along with knowledge of healthful sanitation and hygiene,” concluded the members of the all-female VO. The VO is now not only working on WASH but is also expanding its scope to further empower and improve the livelihoods of the women in the village. “We want to establish a vocational center for women in future. So they can not only learn different skills like stitching, embroidery, but would also have linkages established with different boutiques in cities to improve their living as well as support their dreams and skills,” said Neelam Bibi.